MOSCOW (Sputnik) - As many as nine people, including seven children, died from cholera in Yemen, Youssef Hadiri, the spokesman for the Health Ministry in the Houthi-controlled Sanaa, said on Sunday. "The number of deaths caused by cholera totaled nine, five of [the dead] are female and four are male, with seven victims being children," Hadiri wrote in a tweet. 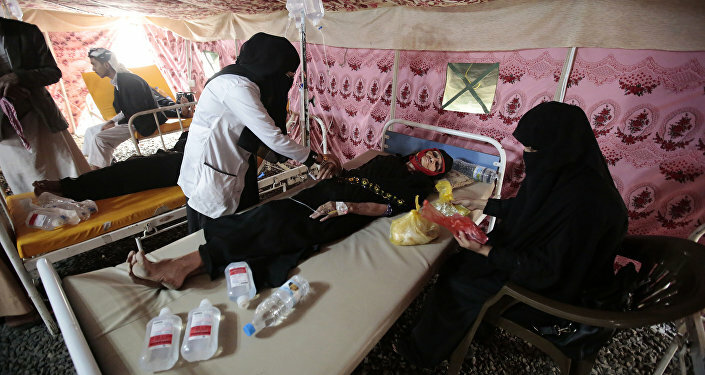 In late August, Stephane Dujarric, the spokesperson for the UN secretary-general, said that the organization had vaccinated nearly 400,000 people in Yemen, however, the concerns about the possible emergence of another cholera epidemic remained. According to the UN information, over 2,300 deaths from cholera have been registered in Yemen since April 2017. Yemen has been engulfed in an armed conflict between the government forces led by President Abd Rabbuh Mansur Hadi and the Houthi rebels for several years. The Saudi-led coalition of mostly Persian Gulf nations has been carrying out airstrikes against the Houthis at Hadi's request since March 2015.